DPS students are discovering more about their own abilities and the world around them through personalized experiences with industry professionals. With DPS CareerCoach, students identify careers they’re interested in pursuing, and are matched with a professional who serves as their mentor, or advisor. This mentor meets with the student regularly to build a relationship, guide them in learning about various career opportunities and to share what they’ve learned as an expert in that field. It is a unique approach to learning that supports students as they plan out their futures and grow as individuals. Microsoft — a global corporation that develops and sells computers, computer software and other electronics — recently matched employees to students through a partnership with the Colorado Technology Association. Microsoft is the creator of the most widely-used operating system in the world — Microsoft Windows — and 15 students at Abraham Lincoln High School are receiving individualized attention from experts as they learn about various aspects of the business. 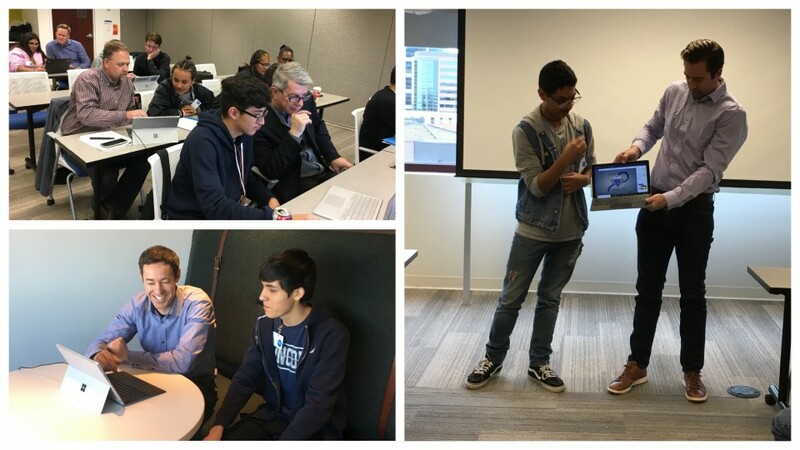 Aside from one-on-one learning, students participate in informational interviews, attend career panels led by Microsoft employees and will tour the new technology center at the Microsoft office, where they’ll learn all about interactive technology. Currently offered in the engineering/energy, technology, manufacturing, biomedical and business industries, students and mentors in CareerCoach meet eight times each school year, where they visit the mentor’s worksite and go on a college campus tour related to the industry. Students involved in the program have higher school attendance rates and show extra motivation in their classes. “Students are making greater connections between what they learn in school and the world of work, making school subjects that much more relevant. They feel more capable of realizing the dreams they have for themselves and their futures,” said Monica Schultz, Work-based Learning Manager for DPS CareerConnect. And while students are flourishing, the program is continually growing, too. In the program’s short three-year history, it has grown from serving 24 students at Lincoln High School to now being offered at 10 high schools serving 260 students. What started as one partnership with City of Denver Technology Services has grown to partnerships with 20 businesses, with plans to keep expanding. “Having a mentor is an investment in yourself and your future. It provides an opportunity to think more seriously about your career path, but also learn from an adult what it means to be part of the working world. By sharing a part of themselves, students are able to make a connection that could last a lifetime!” Schultz said. Students who are interested in the program should contact Ericka Porter. For more information on programs that prepare students for college and career success, we invite you to visit collegeandcareer.dpsk12.org.